Our Citrus Wine Jelly is the ideal accompaniment to roasted meat or cheese platters. Made with oranges, lemons, wine and brandy, this homemade jelly is perfect for holiday gift-giving. GRATE rind from one orange and the lemon. Squeeze the juice from both. COMBINE juices, rind, orange pulp, sugar and wine in a large saucepan. Mix well. 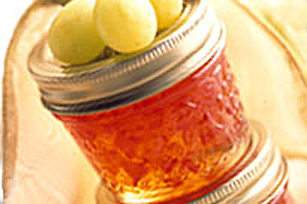 POUR jelly into warm sterilized jars half filling each one, then fill top half of jars up to 1/4 inch from rim. (Orange pieces might float to the top).